The nine of spades (or nine of swords in the Minor Arcana of the Tarot) is a card of evil omen. 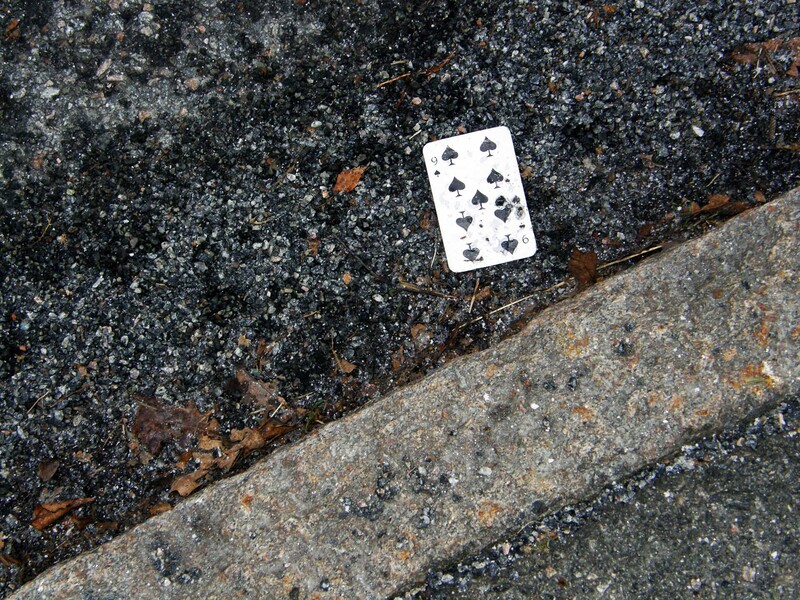 Just this card all on its own in the gutter of Rambergsvägen. I took this photo early in 2013 and uploaded it to my now slumbering once daily photoblog at GBG365 on 14th January 2013. Today I choose it as my photo of the week in part because it’s Friday 13th today and it seemed appropriate. Over the years I found so many odds and ends lost or strayed – or perhaps deliberately left out – as I was photographing around Gothenburg. Gloves and mittens. Lots and lots of gloves. And dummies (pacifiers), children’s bonnets, toys, caps… I once found a door key. Another time I found a car key. Cards also – though no more playing cards. This one seems to be from a Swedish Trivia game.